Our office and the our Visitors Center are located to the west of the Marshall Islands Resort in Delap. 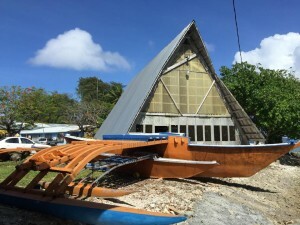 The most prominent feature is the large A-frame Canoe House, which is used for vocational training. The single-story building next this is the Visitors Center, while the two-story office and education building is behind the Canoe House, alongside the lagoon. Once inside, the office is upstairs. If you would like to support our work, we welcome donations. You can send a check in any amount made out to Waan Aelon in Majel. Nothing is too small to help us.